I love drawing games. I own no fewer than 4 drawing-based board games, and I still look back at iSketch once in awhile to see if it’s ever going to be fixed (cue Ron Howard voiceover: “It won’t”). Tee K.O. combines all the fun of forcing your friends to play a drawing game with you and with making poor online shopping decisions. The bright, scary-cute Japanese demon characters and catchy soundtrack made this a fun addition to our party game repertoire. I love games with simple hooks. “Work with a partner to cut yourselves into shapes to solve puzzles” might sound like a one-trick pony, but Snipperclips has a surprisingly amount of variety. Some of the levels took us 30 seconds to solve, and some took 30 minutes. It’s completely appropriate for kids- even young ones, if you have some patience- but fun for adults, too. “How can a game about Tetris have characters and a plot?” It can’t, really, but it can have some cheeky humor and tons of fun puzzles. There are plenty of single- and multi- player game modes for those enjoy Tetris, Puyo, or both. You’ll find yourself repeating the characters’ spam lines and making combo chains in your head when you try to sleep. Then you’ll get up to play just one more level of the Story mode, and then realize it’s 3:00 am. Oops. There is a dearth of 3-player co-op games outside of the shooter genre. Enter Lovers. You can play solo, or 2-4 players can cooperate to pilot a round, neon spaceship around the universe and rescue huggable creatures from the evil “Anti-Love” agents. Pilots can navigate, man whimsical weapons, work the ship’s moving shield, and place upgrade gems. This game hit a sweet spot of difficulty for me. It was hard enough that our team of 3 had to repeat some levels and boss battles, but not so difficult that I wanted to drive our ship into a black hole and play something else. We had just the right amount of swearing and cheering on our co-op couch. I’m sure that everything I could possibly say about the quality of this game has already been said. The Super Mario franchise has had some low points and money-grab titles, but the core adventure game series has been consistently good. Super Mario Odyssey exceeded my expectations. I like to take expansive games with minimal plot slowly and savor the experience, so I’m sure I’ll be playing this one on and off for years. You’ll know I’ve been spending time with Odyssey when you hear me humming the Tostarena theme on loop. It’s just so catchy! You don’t have to ask me twice to play a trivia game or watch a campy horror movie, but may I suggest we do both? Trivia Murder Party satisfies my living-room game show needs, and the eerie twist keeps it interesting enough for other people to want to play. The Killing Floor minigames help level the playing field. The rounds are short. No keeping track of plastic pie wedges. Just be prepared to cut off a finger if your potpourri knowledge isn’t up to snuff. I’ve had my eye on Cuphead since the first preview. I’m a Betty Boop fan from way back, so I (like many others) was immediately captivated by the true-to-form animation. Then, the bad news came: this was going to be a bullet hell boss-rush game with platforming elements. To put this in perspective, imagine someone told you that they ordered you a free pizza from your favorite place, but it’s a white pizza with anchovies, pineapple, and scotch bonnets. When the game was released, I resigned myself to watching Aaron and Cory play. Then, I heard the big band music kick in, saw the bouncy animation, and I resolved to get out of my comfort zone. Cuphead is my game of the year because it was not only an irresistable tribute to rubber hose animation, but real ring-a-ding-ding to play. There’s been an endless amount of discussion about how difficult this title is. I will not dispute that at all, but I will say that it’s not impossibly difficult, even for the 2D-challenged. Cuphead opened my eyes to a kind of gameplay I previously had very little interest in (sorry, Contra fans). Most Feels: I didn’t play many plot-heavy games this year, but saving the little bunnies in Lovers in a Dangerous Spacetime did make me smile. Biggest Disappointment: I know this was the year of the open world game, but Final Fantasy XV just didn’t do it for me. While the graphics were beautiful and detailed, the story didn’t draw me in, even though I watched the movie and anime shorts associated with the game. When I play a Final Fantasy game, I’m looking for two things: a great story and a combat/upgrade system that’s fun and rewarding. The place in my heart for open world games is already filled with Oblivion and Skyrim, which provide much more freedom and better writing. This felt like a Final Fantasy mod of World of Warcraft. Final Fantasy XII also had WoW– like missions, but the characters, gambits, and license board kept it from feeling like an exercise in tail-chasing. I wanted to like this game. I just didn’t. Funniest: I think I laughed the most at Mass Effect Andromeda, even though I didn’t play a minute of it. The buggy videos were enough. 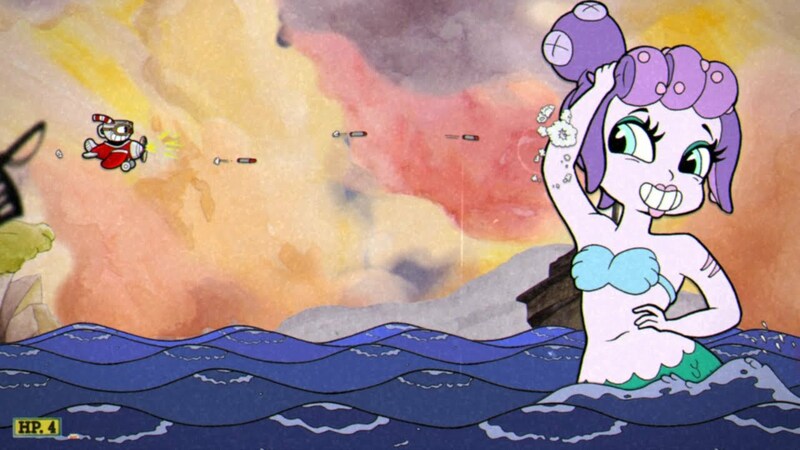 Prettiest: Cuphead. The character design, colors, and film-aging filters really took me back to the cartoons I love. Best Early Access Game: Hacktag certainly has potential. There are some improvements to be made to dialogue translations from the original French, and it still has some bug issues. We’ll see if Aaron and I are still stealing government data as sassy cat people in 2018. The One That Got Away: From what I’ve heard, the story in Nier: Automata is full of existential questions and robots. I’m interested. Of Course I’ll Rebuy That: I didn’t actually re-buy Star Ocean 3: Till the End of Time because it wasn’t re-released. I did restart it, though. I can’t remember if this will be my third or fourth play through. I really like the story and characters, and the invention system has no business being as fun as it is. That Beat, Tho: I’m still stuck on the Undertale soundtrack, so I’ll give it to The Legend of Zelda: Breath of the Wild with an honorable mention for Cuphead (Cuphead can’t win every category). I liked the peaceful, minimal soundtrack, mostly because I could actually fall asleep to it when Aaron stayed up late playing. Best Multi-Task Game: Paper Mario: The Thousand-Year Door was new to me this year, and it was very easy to take care of laundry, cooking, or whatever other more urgent thing needed my attention in between combat turns. The Future Is Bright: We saw a preview of YIIK: A Postmodern RPG at PAX East that looked like a lot of fun. A young, lonely man in suburban New Jersey gets hooked on an Internet conspiracy theory forum. What happens next remains to be seen.